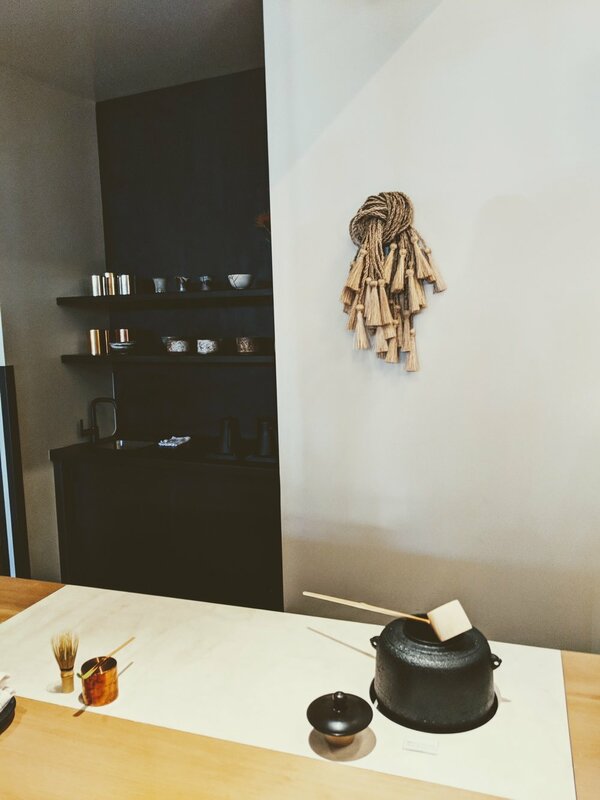 Last Saturday I attended the grand opening of Stonemill Matcha Cafe, the newest addition to the San Francisco tea scene. There had been plenty of media buzz around the opening and I was waiting in anticipation. 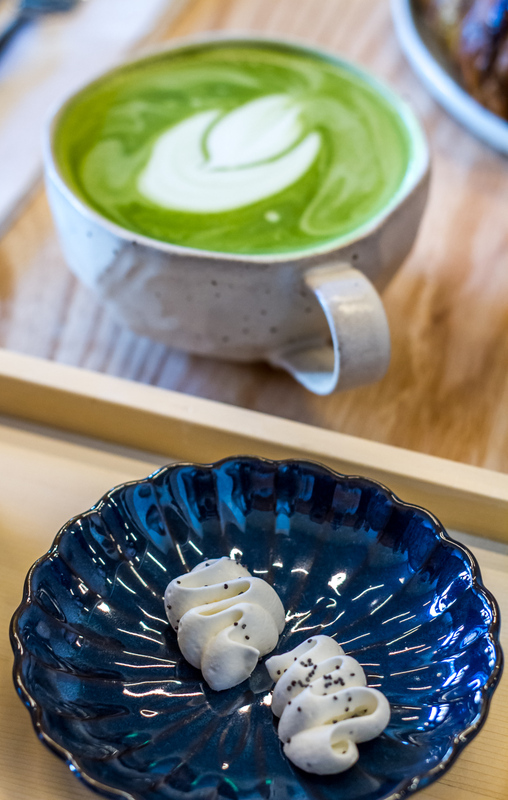 Eater SF had described it as a “premium matcha experience” with “stone ground matcha from Kyoto” and “serene environs” and that it would highlight matcha tea in an “educational” way. But that was not all. The pastry program included a pastry collaboration with Tartine Manufactory and the menu was described as “elevated Japanese comfort food” (*). Need I say more? The concept intrigued me. The tea enthusiast in me was doing somersaults. The gourmand in me was ecstatic. Shortly before 8 am last Saturday I joined the small line that had already formed on the sidewalk in front of Stonemill Matcha Cafe. I was very excited for a “grown up” matcha experience, where quality was at the forefront in both the tea and the food and not another victim of Instagram trends. The exterior of the cafe was immediately pleasing to the eye with its refined color palette of muted blue and its sidewalk potted garden with outdoor seating. The interior design is worthy of a Michelin-starred restaurant. On the left to the entrance there are a few floating shelves with matcha tins and teaware. Part of the bar area is a display of handmade chawans (tea bowls), including one designed by San Francisco based MM Clay. An Ikebana-inspired flower arrangement adorns the pastry case filled with neatly arranged rows of baked goods, desserts and confections. At the back there’s the “ceremonial counter”, with the traditional equipment to make matcha. A cast iron kettle traditionally used to heat the water for making tea, a long-handled bamboo ladle, copper tea tins, bamboo whisks. After ordering and paying, we were invited to watch our ceremonial matcha being prepared. Next to it, the matcha stone mill. I gave it a go, it’s a workout but super fun. What we ordered. 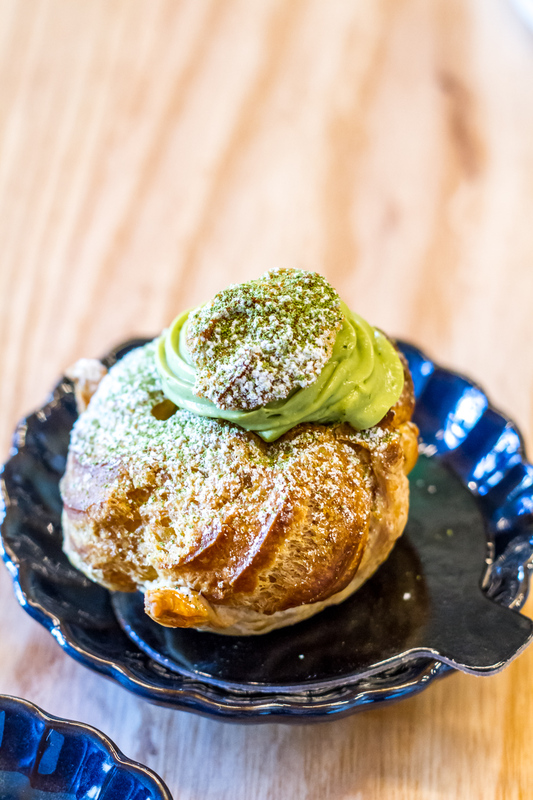 Ceremonial matcha, matcha latte, matcha croissant, furikake everything-spiced croissant filled with cream cheese, matcha cream puff, matcha white chocolate wagashi. My dreams are made of this stuff. I found the matcha itself to be high quality. The unsweetened matcha latte was one of the best I’ve ever had. The food was exceptional, even though the matcha croissant wasn’t super matcha-flavored (but I can see why). I can’t wait to go back and try everything else, especially the items from the kitchen like the Matchazuke (rice, salmon, nori, green onion, chicken dashi and matcha), the Shokupan Toast with matcha butter & anko jam and the hojicha latte. My friend and fellow tea blogger Mike (The Tea Letter) was there too! Read his blog post here. Stonemill Matcha Cafe is located at 561 Valencia Street in the Mission neighborhood in San Francisco.